Recently I wrote about Natural Light Photography and while some people define Available Light Photography and Natural Light Photography as the same thing, I want it to be clear, this post is NOT just about Natural Light! As another photographer once put it, "I shoot available light. Any damn light that's available." Yesterday I had the honor of working with Rachel McCash who is currently Miss South Salt Lake and is running for the 2012 Miss Utah/USA title (prelims start later this week). I have worked with Rachel before, doing pictures before her attempt at the title in 2009, so being asked to work with her again is especially an honor. Due to our complex schedules this year, the only time we could get together was on a Saturday afternoon in the middle of broad daylight. And that is where today's story begins. As a general rule, I shy away from broad daylight whenever I can, opting for shade, for cloud cover, for sunsets, whatever. I like to be in control of the light. And so I know, going into this set, that shooting outdoors at 3:30 meant that I had to be prepared to take pictures in ways that I don't normally take pictures. First a bit of background information. 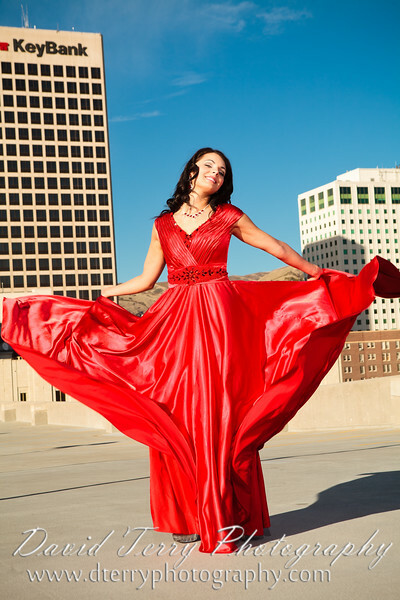 Since Rachel is running as Miss South Salt Lake, the idea we came up with was to include some of downtown Salt Lake City as part of the background for her set. To do this, we decide to shoot on top of a parking garage with some of Salt Lake City's buildings and mountains in the background. So let's run through a bunch of examples with explanations below each one. Here we have Rachel standing with the sun to her back (the sun is high and to the right as evidenced by the shadows that you see on the ground). I'm using the sun as an "accent light" for her hair, her arm and hip. An accent light is what helps separate the subject from the background by defining the edges. From there, I added a flash (Canon 580EX II) on a light stand positioning it to the left. I will often use opposing lights like this. The sun and the flash are directly facing each other and Rachel is in between them. I turn her face into my light, because that's what gives her beautiful check bones a lovely 3D appearance. This is definitely not my usual shooting style. Rachel is in direct sunlight here, with fill flash to soften some of the shadows. One advantage to shooting in direct sunlight is that you get a blue sky. The downside is usually that the subject is squinting. So to avoid that, I had Rachel looking down (I do have a few images where I asked her to look at a building that was in the direction of the sun, but this was very hard for her to do). Here I have Rachel's boyfriend, Scott, holding a 6' diffusion panel. You can see the shadow created by him (his legs) and the diffusion panel down on the ground. The nice thing about a diffusion panel is that, being about 6' tall and 4' wide, it creates a light source that is much larger than the sun ("soft light" is dependent on the apparent size of the light in relation to the subject) while at the same time remaining a directional source of light (the light still comes from the direction of the sun). One downside of this kind of light is that Rachel is now receiving about one stop of light less than the background which, if we expose for Rachel, causes the background to go bright. I wanted to note, too, that while I typically turn the subject at about a 45 degree angle to the camera, I felt that this "straight on stance" was bold and showed Rachel's confidence. She is a winner! Rachel is in the shade of the building to my left. In addition, the sun has gone down quite a bit and is partially obscured by clouds. This has also changed the amount of light hitting the buildings behind her as they are no longer in direct sunlight on them (though you can see the mountains still have some sunlight). In this case, I chose to light Rachel up by using a single flash shooting through an EzyBox Softbox. I discuss this softbox in detail and why I like to use it on my blog here. 5. Beat the sun with flash. The challenge to beating the sun with flash, is that the flash has to put out enough light to balance your subject with the background. I could, of course, simply expose for Rachel and cause the sky to go pure white. But instead, I wanted a "bold" look by putting the sun right over her should and still allowing the blue of the sky to be seen. You can see the brightness of the sun based on the shadows extending in front of her and how bright my flash was by the shadows extending behind her. Remember that light diminishes with the square of the distance. So while her face was lit up pretty good (the flash was just outside of the frame to my right), by the time the light hits the ground it has traveled a good distance and is no longer as bright. In addition, I believe this image was shot with a bare flash (no light diffusion). You can tell this by the shadow underneath her nose. It is extremely rare for me to use a reflector - in part because I'm usually working alone and it is difficult to position a reflector and keep it in position (the sun is always moving, people may be moving, and as is often the case, there may be wind to deal with). For that reason, I'm generally using flash. Another reason for my preference to use flash is that, for a reflector to work, it needs to bring to bear on the subject nearly the same amount of light as you get from direct sunlight. And one of the reasons I don't like to work in direct sunlight is that it causes the subject to have to squint. Rarer still is for me to use the gold side of the reflector. I just think that turning someone's skin gold can sometimes make them look jaundiced. But I felt, in this case, that Rachel's skin tones would work well with the gold reflector. I want to point out that I instructed Rachel's boyfriend to hold the reflector ABOVE her and angle the light down from above. So many times I see photographers positioning the reflector down below the subject. This creates unnatural shadows. Most obvious is when the shadows from the nose angle upwards. Most annoying is when the cheeks create shadows into the recesses of the eyes. We instinctively know that sunlight and most light comes from above, and so when the shadows extend upwards, we know something is wrong even if we can't quite identify it. Yes! This one is completely natural light. No reflector and no flash. Yet, you may wonder, how do I get the catch lights in her eyes? It is easy. By having Rachel get down on the ground (sitting in the shade of the building) and look up towards the open sky, the sky then becomes my directional light source and the brightness of the clouds overhead become the catch lights in her eyes. Here I'm using a diffusion panel to knock down and soften the light that is landing on Rachel, and then using a flash plus softbox to light up her face. The sun is on the left, with the diffusion panel creating my "base exposure", with the flash on the right with her facing into the flash to highlight her check bone structure. Here the sun has gone behind the clouds creating soft light coming from the right. I'm using a flash shooting through a softbox on the left to light her up (you can see her shadow on the ground to the right). Because the other side of the fence is a "drop off", there is no place to put my flash that is near her. Due to the distance I'm working with on the flash, I opted to shoot at 1/200th - to avoid the lower light output that is generated when using high speed sync (HSS). That is the reason I am shooting at f/7.1 here instead of a lower aperture. There are 3 things going on here: 1) The sun is on the left (you can tell that by looking at the light pole shadow behind her). She is standing in the shadow of my diffusion panel, held by her boyfriend. 2) I am using a fill flash (straight back behind and above the camera) to give some additional fill lighting on her face, and 3) I am using a main flash to the right shooting through a softbox to give her some directional lighting. If you look at her eyes you can see the two flashes reflected in her eyes. I'm hoping I've given enough detail to answer most questions. But I'm always happy to answer any photography related questions, so if I've missed something, feel free to ask!